Edward Boches is a Boston based photographer with an interest in documenting how people live, work and play. 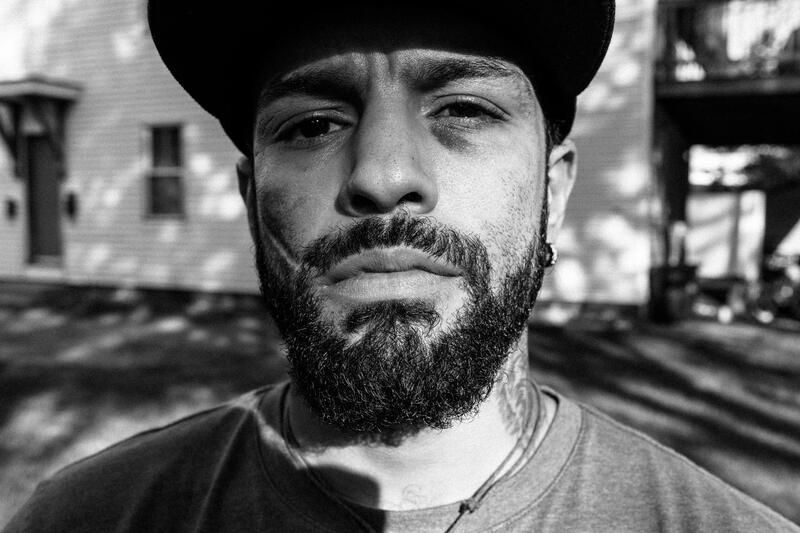 Recently, inspired by an economic and political climate that exaggerates our differences and emphasizes divisiveness, he finds himself drawn more and more to the places and activities that bring people together, whether that be urban skate parks, the front porches that line city side streets, or the communities that develop around urban boxing gyms. Boches has exhibited at the Griffin Museum of Photography and at the Providence Center for Photographic Arts. His work has appeared in The Boston Globe, The Lowell Sun, online at WBUR.org and on other sites in support of the arts. Future exhibits include Griffin@SoWa Gallery in spring 2018 and the Brewster Ladies Library in the summer of 2018. 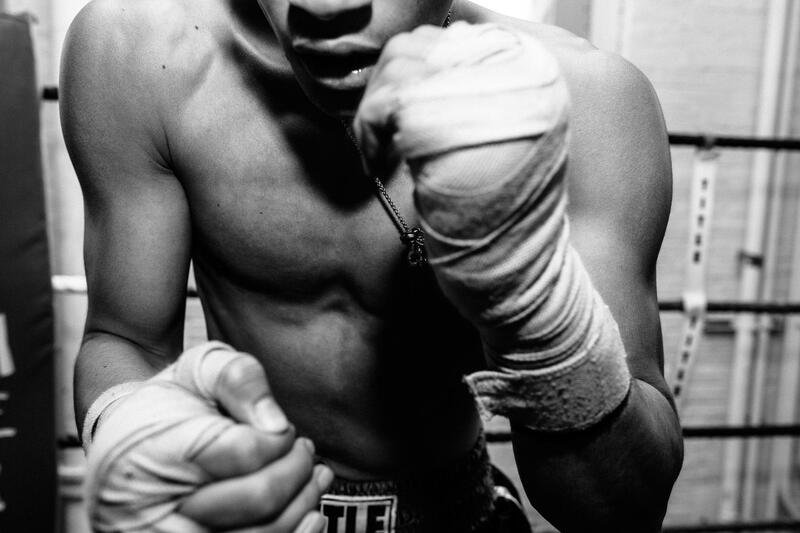 A fighter displays a knife scar from a gang fight when he was 11 years old, and a black eye from a recent bout. 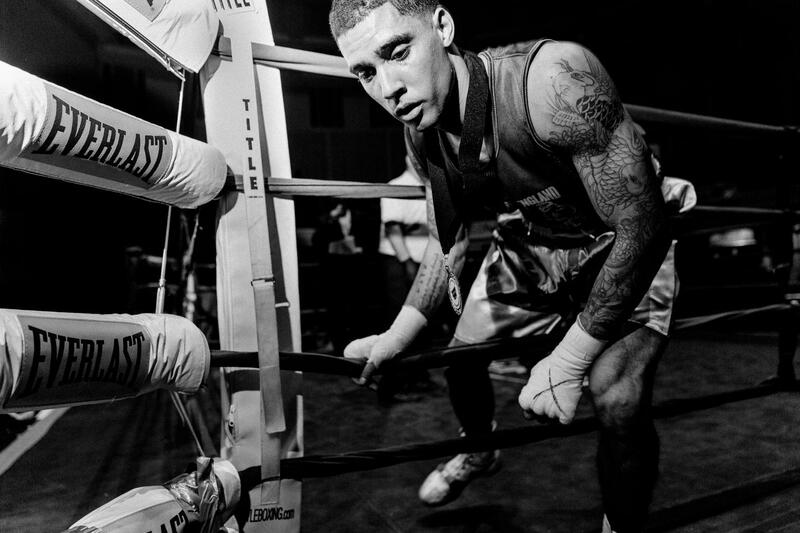 Boxing saved him from the gangs and drugs that took his father and other family members. Fame, success, even self-respect can be elusive goals for many young men and women who grow up in the inner city. 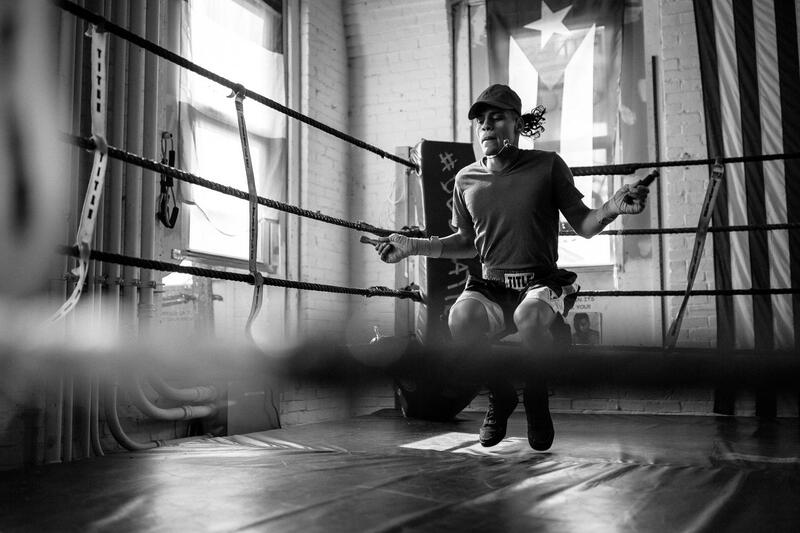 But the boxing gym, as it has for decades, promises a way up for some, a way out for others. It offers young boxers a home where they find support and community. It builds character. For many it's also the source of discipline needed to avoid the constant lure of gangs or drugs. During 2017 I spent a lot of time in the gyms of the old mill towns north of Boston and attended numerous local amateur boxing matches. 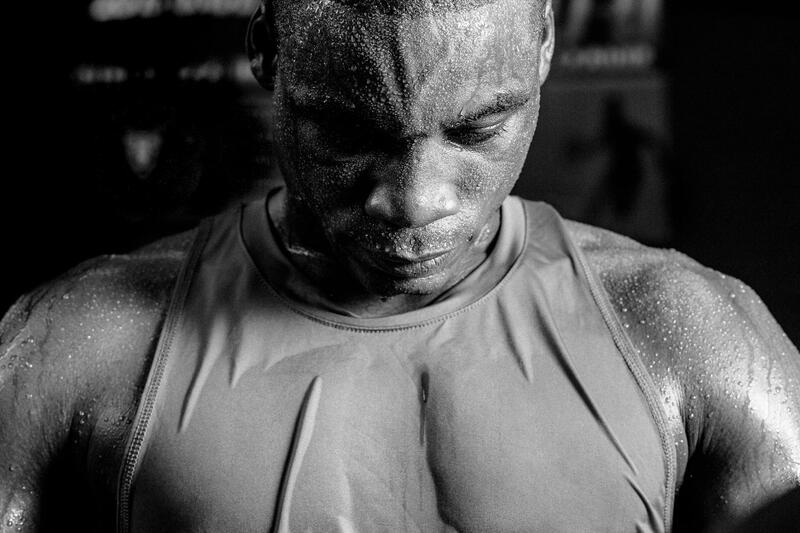 I got to know many of the boxers -- and the trainers committed to them --and found them to possess an inner strength as well as a physical one. It takes both to step into the ring. To put the body through the punishment boxing demands. To make the sacrifices needed to achieve a few moments of glory. My intent with this project is to celebrate the strength and courage it takes to be a fighter. Many of the gyms in the working class towns north of Boston are housed in old mill buildings. They can be dark and cold in the winter. Hot in the summer. 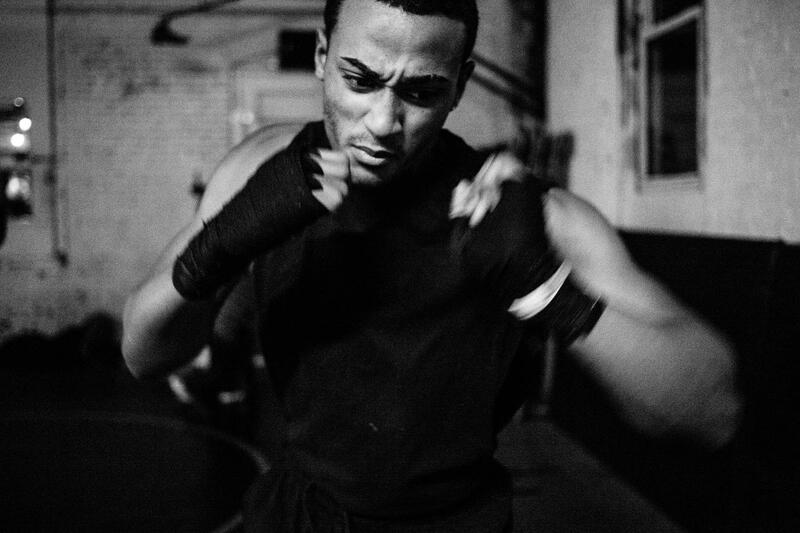 Here a fighter trains in the Intenze gym in Lawrence, MA. 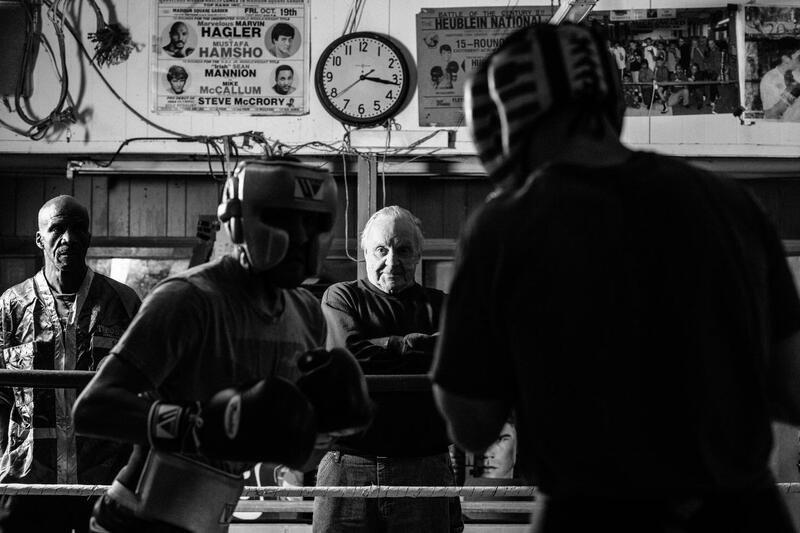 Arthur Ramalho, 82-years-old, has devoted most of his life to training young fighters and offering them a way to stay off the streets at his West End Gym in Lowell, Massachusetts. 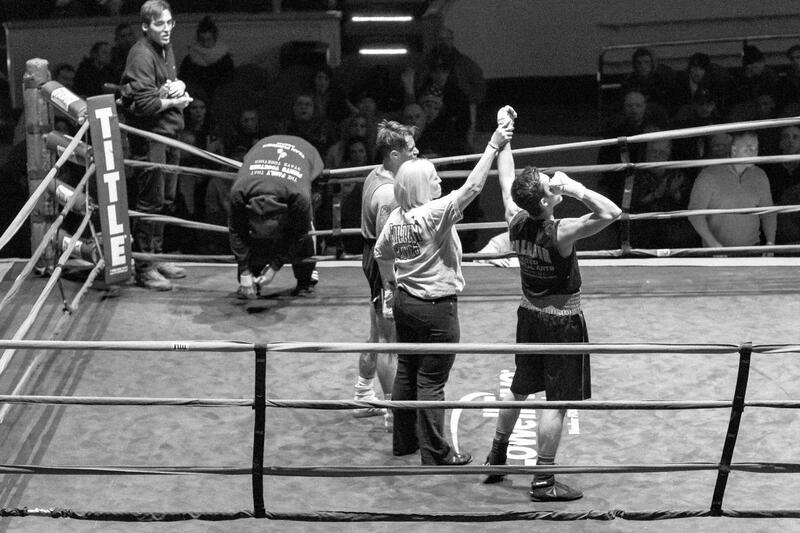 Many of the gym owners and trainers generously give their time, and even money, to their young fighters, often struggling to get by and keep their gyms open. A doctor checks a fighter after the bout. Despite the violence of the sport, trainers, officials and doctors place a significant emphasis on the safety of the fighters. A trainer carefully tapes a fighter’s hand before a match. It is said that the kindness that boxers show to one another derives from the gloves. When you are wearing boxing gloves, you are helpless to do anything for yourself, whether taking a drink or water or blowing your nose. 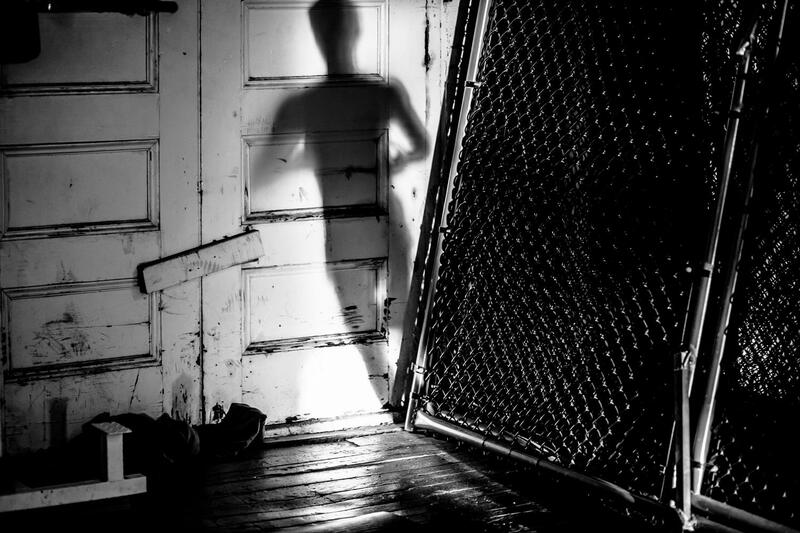 A fighter shadow boxing in the ring. Boxing in many ways is a lonely sport. It’s just you, your concentration, your preparation and your opponent. Training itself is rigorous. Heavy bags, speed bags, road work, and jumping rope all combine to build a fighter's wind, strength and stamina. 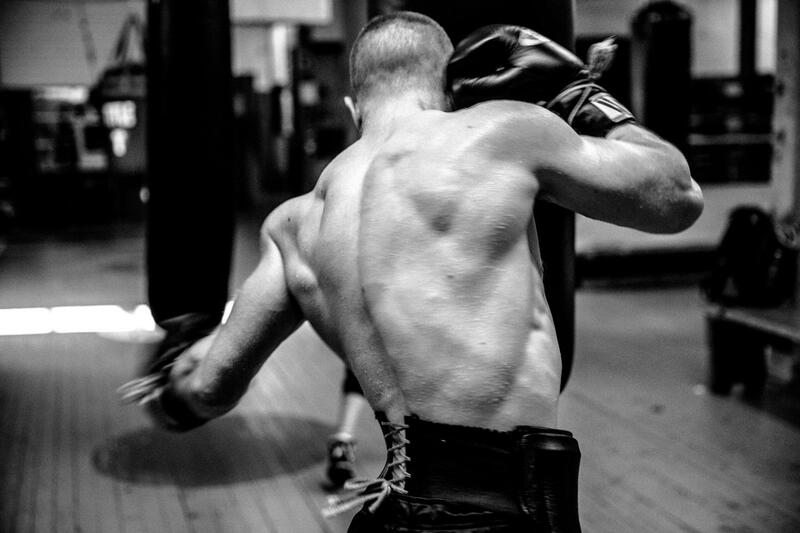 A fighter runs laps in a dark and cold gym in Lawrence, Massachusetts. In many of the old gyms trainers and fighters make due with the basics. A ring, old tires, ropes and the bags. 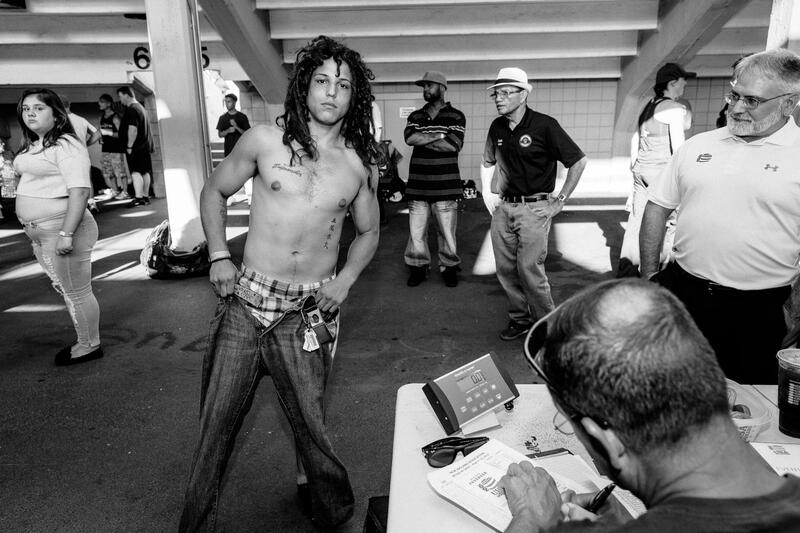 A fighter slips back into his pants after weighing in at an outdoor boxing event. Weigh-ins can take place right in public view. Recently, following all the attention to the #metoo movement, officials have made weigh-ins for women boxers private and separate. 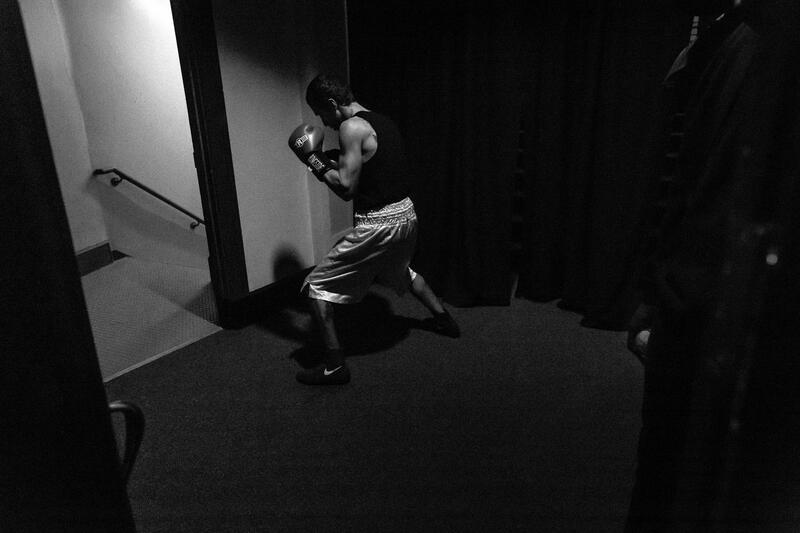 A fighter warms up in a hallway outside the auditorium moments before his match begins. A fighter stripped down to his shorts for weigh-in. 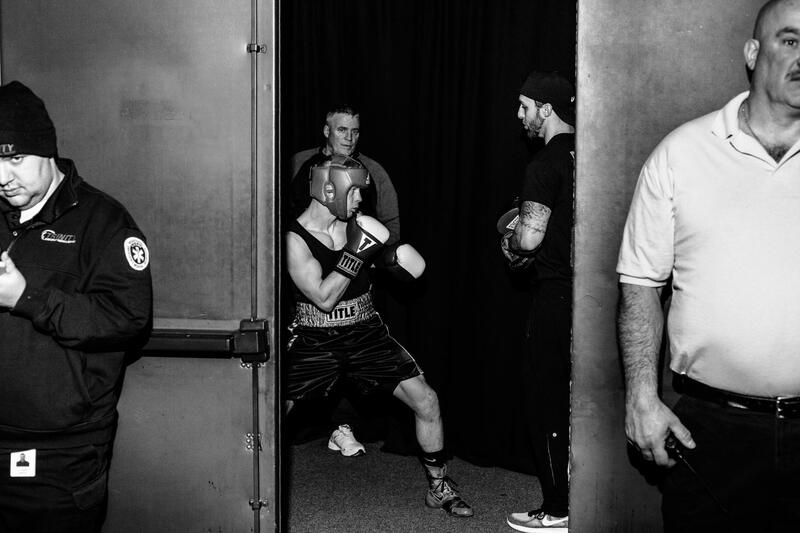 A fighter warms up in the stairwell before being called to the ring. 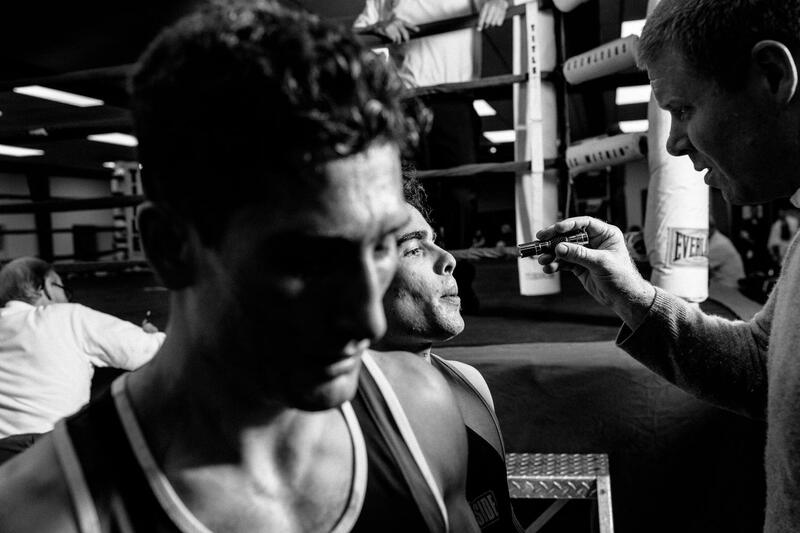 For a competitive boxer, focus and concentration are as important than physical conditioning. 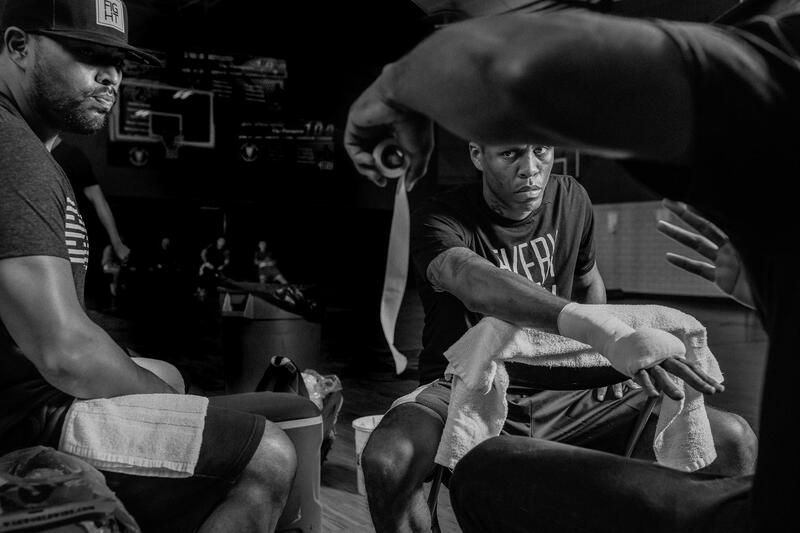 Once in the ring, a boxer needs all of his senses working in tandem for every second of every round. A referee counts to 10. 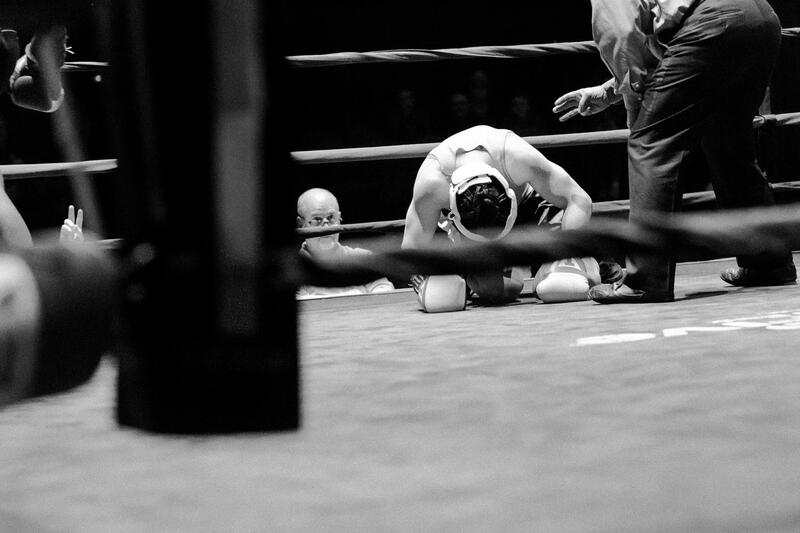 Knockouts are rare in amateur fights, but a referee will call the fight over if a boxer is hurt. 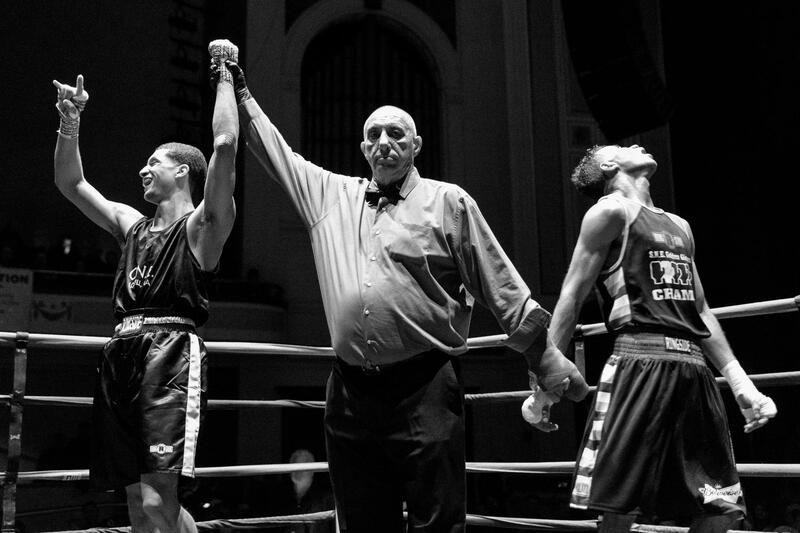 A young fighter prevails in the New England Golden Gloves finals, earning a trip to the national championship. For his opponent, the year-long quest for glory comes to an abrupt end. The entire story. The joy of winning and the disappointment of losing. Often boxing matches are close and the decisions questionable. A trainer's reaction to his fighter's loss suggests he is surprised with the outcome. You can see the look of defeat on this fighter’s face as he exits the ring. A boxing match happens fast. Only after it’s over do you have time to consider what went wrong. 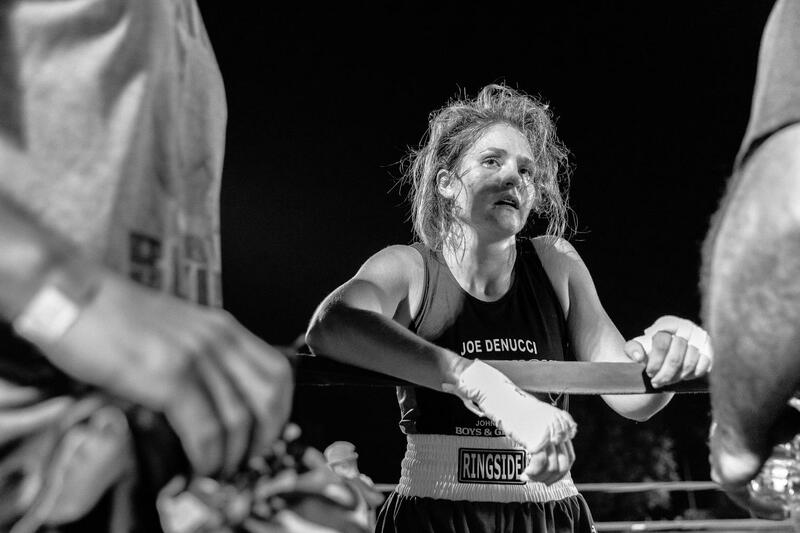 A young woman fighter, spent after three rounds, waits for the judges decision. 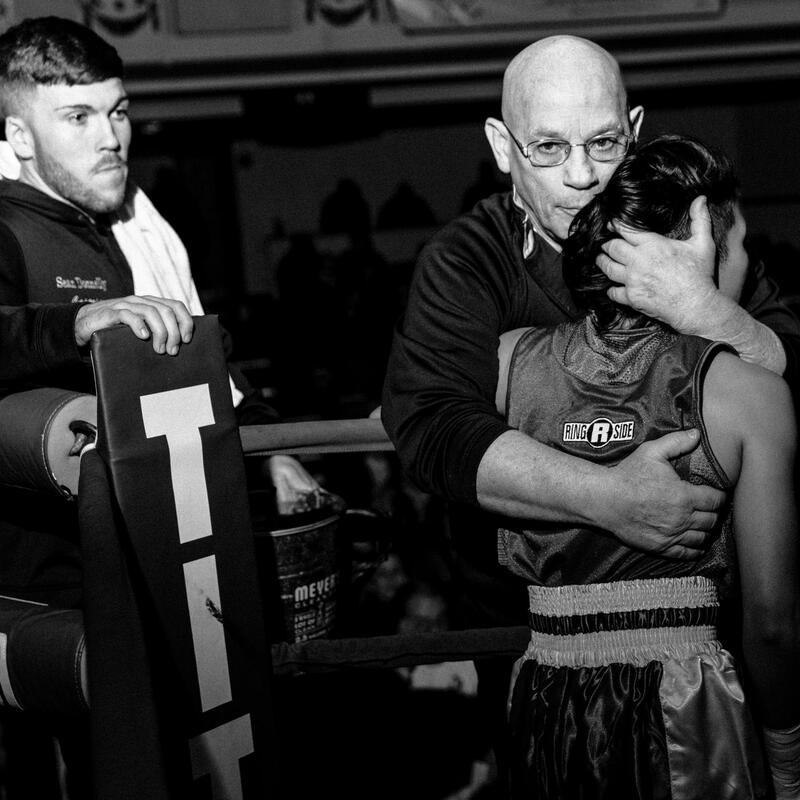 A trainer hugs his fighter after a bout as they both await the judges' decision. A fighter works the heavy bags in Lowell’s famed West End Gym, the same gym where former world champion Irish Micky Ward honed his craft. Sadly, this venerable gym recently had to move out of the old mill it occupied for the last 37 years, a victim of upscale condo development. 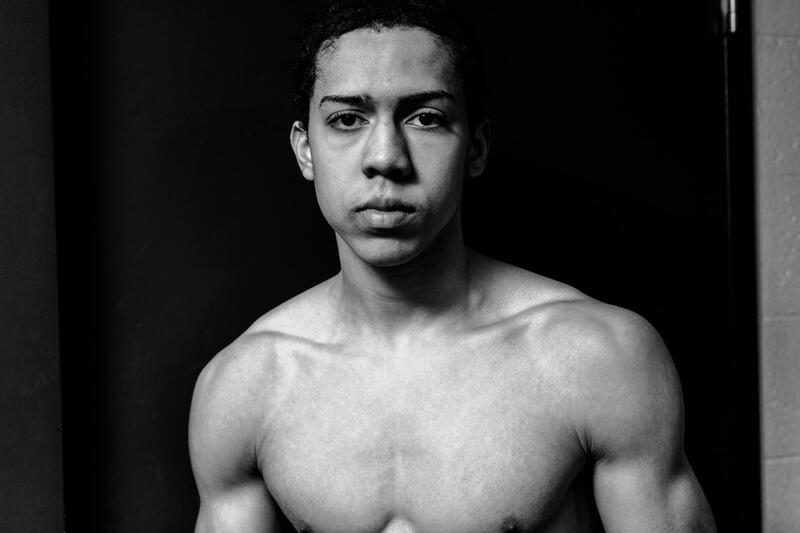 Fifteen minutes after he won a fight at the New England championships, this fighter continues to perspire, evidence of just how much three hard fought rounds can take out of you.